PALLAMERSE™ SMT 2000 palladium process is an improved process to coat printed circuit boards with palladium for subsequent SMT assembly applications, and is capable of autocatalytic deposition of palladium-phosphorus coatings on either copper or nickel. 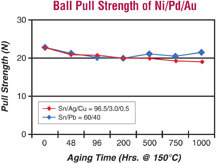 Using electroless palladium creates a barrier layer between gold and nickel, preventing corrosion of the nickel surface during the gold deposition process. This eliminates all possibilities of solder joint issues related to "black pad" corrosion. 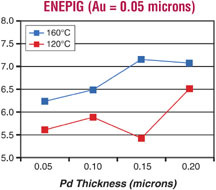 Dow Electronic Materials' electroless palladium process can be used as a universal final finish when used in conjunction with electroless nickel and immersion gold processes in the ENEPIG process.